The ride-hailing service released a statement Tuesday night saying 29-year-old Sayfullo Saipov passed a background check to become an Uber driver and had been actively driving on the platform for more than six months. Saipov has since been banned from the Uber app. 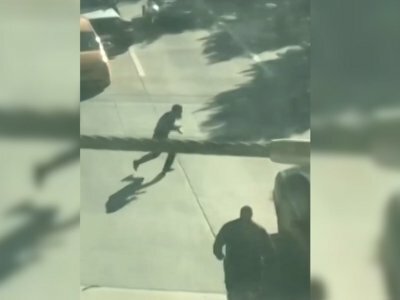 The company says it has reached out to law enforcement to provide its full assistance and is “aggressively and quickly reviewing” the suspect’s history with Uber. A U.S. official familiar with the investigation into what happened says Saipov is from Uzbekistan and came to the U.S. in 2010. Associated Press writers Colleen Long, Sadie Gurman and Michael Balsamo contributed. Argentina’s Foreign Ministry says five of the nation’s citizens were among the eight people killed in the truck attack on a New York City bike path. And the deputy prime minister and foreign affairs minister of Belgium says in a tweet one of the dead was Belgian. Belgians and Argentines also are among the 11 wounded in Tuesday’s attack. Argentina’s Foreign Ministry says the Argentine victims were in a group of friends who traveled to New York from Rosario. It says they were celebrating the 30th anniversary of graduating from Polytechnic College of Rosario. Police say they shot and wounded the attacker and took him into custody. President Donald Trump says he has ordered the Department of Homeland Security “to step up our already Extreme Vetting Program” following the deadly truck rampage on a New York City bike path. A man in a rented pickup truck mowed down pedestrians and cyclists along a busy bike path near the World Trade Center on Tuesday, killing at least eight people. Officials not authorized to discuss the investigation say the attacker is from Uzbekistan and came to the U.S. legally in 2010. Two law enforcement officials say a note was recovered inside the truck that barreled down a bike path near the World Trade Center, killing eight people. The officials weren’t authorized to speak publicly about an ongoing investigation and spoke to The Associated Press on the condition of anonymity. Police say the truck’s driver turned onto the bike path Tuesday afternoon, striking several people before plowing into a school bus. Officials say he got out of the truck waving a pellet gun and a paint gun and was shot by a police officer. He’s in critical condition after surgery. Associated Press Writers Tom Hays and Colleen Long contributed to this item. Police investigating a rented Home Depot truck’s deadly rampage down a bike path near New York’s World Trade Center have surrounded a white Toyota minivan with Florida plates parked in a New Jersey Home Depot lot. The van is parked near the company’s rental trucks. Officials tell The Associated Press the man suspected of killing eight people and injuring 11 more on the bike path rented a truck from a Home Depot in New Jersey about an hour before Tuesday’s attack. The Passaic (puh-SAY’-ihk) Home Depot remains open. The minivan is cordoned off. Home Depot spokesman Matthew Harrigan says the company is “fully cooperating” with law enforcement. He says the company requires a driver’s license, insurance information and a credit card deposit to rent a truck. New York Gov. Andrew Cuomo (KWOH’-moh) has increased security at airports, bridges, tunnels and mass transit systems around the state following a vehicle attack on a bike path near the World Trade Center. Eight people were killed and 11 were injured when a man drove a rented truck down a bike path Tuesday afternoon. Police say they shot and wounded the attacker but he’s expected to survive. A U.S. official familiar with the investigation into what happened says the man is from Uzbekistan and came to the U.S. in 2010. Another official says the man has a Florida license but may have been staying in New Jersey. The head of the New York City schools system says two staff members and two students were injured in a school bus that was struck by a motorist who drove a rented truck onto a bike path, killing eight people. Schools Chancellor Carmen Farina (fah-REEN’-yah) says trauma counselors will be provided in the schools Wednesday. The attack happened Tuesday near the World Trade Center and several schools and is being called by city officials an “act of terror.” It set off panic in the lower Manhattan neighborhood, with people screaming in fear and the bike path left strewn with mangled bicycles and bodies. A U.S. official familiar with the investigation into what happened says the man is from Uzbekistan and came to the U.S. in 2010. A U.S. official familiar with the investigation into a man suspected of driving a rented truck down a bike path near the World Trade center and killing eight people says the man is from Uzbekistan and came to the U.S. in 2010. The official was briefed on the investigation but wasn’t authorized to speak publicly and talked to The Associated Press on the condition of anonymity. The official says Sayfullo Saipov rented the vehicle Tuesday afternoon about an hour before the attack. A law enforcement official says Saipov has a Florida license but may have been staying in New Jersey. Police say the man was shot by officers and is hospitalized. The man is in surgery and is expected to survive. He can’t be reached for comment while in custody. Argentina’s Foreign Ministry has confirmed “Argentine citizens died” in the vehicle attack on a bike path near New York’s World Trade Center site, but it hasn’t said how many. A statement says the Argentine Consulate in New York is working with local officials to identify the victims of Tuesday’s truck attack. The statement says the Argentine government “is deeply shocked” by what happened. Eight people were killed. Several others were injured. Authorities say the attacker was shot by police and is hospitalized. A U.S. official familiar with the investigation says the 29-year-old man suspected of driving a rented truck down a bike path near the World Trade center, killing eight people is from Uzbekistan and came to the U.S. in 2010. The official was briefed on the investigation but was not authorized to speak publicly and spoke to The Associated Press on condition of anonymity. The official says the suspect, Sayfullo Saipov, rented the van Tuesday afternoon at about 2 p.m., about an hour before the attack. A law enforcement official says Saipov has a Florida license but may have been staying in New Jersey. The official wasn’t authorized to speak publicly about the ongoing investigation and spoke to The Associated Press on the condition of anonymity. Saipov was shot by police. He’s hospitalized and can’t be reached for comment while in custody. He is in surgery and is expected to survive. President Donald Trump is vowing his administration’s “full support” to New York City’s police department in the wake of what he’s calling a “cowardly” terrorist attack. A man in a rented pickup truck mowed down pedestrians and cyclists along a busy bike path near the World Trade Center Tuesday, killing at least eight. Trump’s statement comes after a series of tweets in which he declared “Enough!” and suggested the Islamic State group might be involved. Boston police say there’s no threat to their city after a vehicle attack on a bike path near New York’s World Trade Center site and memorial left at least eight people dead and 11 others injured. Authorities say a man in a rented pickup truck mowed down pedestrians and bicyclists along the busy bike path Tuesday. New York’s mayor calls the attack “a particularly cowardly act of terror.” The driver was shot by police and taken into custody. The police department is reminding officers to be “extra vigilant” during their Tuesday evening patrols, paying particular attention to areas that tend to attract large crowds. A state police spokesman tells The Boston Globe police have no plans to step up security measures. President Donald Trump is railing against the Islamic State group after a man drove a rented truck onto a bike path in New York City, killing eight people. New York City’s mayor has labeled the Tuesday attack in Lower Manhattan a cowardly “act of terror.” But local officials have made no mention publicly of the Islamic State group’s possible involvement. A law enforcement official who was not authorized to discuss the case publicly and spoke on condition of anonymity said witnesses told police the attacker yelled, “Allahu akbar!” as he got out of the truck. The officials have knowledge of the probe and have identified the suspect as 29-year-old Sayfullo Saipov. The officials aren’t authorized to speak publicly about the ongoing investigation and spoke to The Associated Press on the condition of anonymity. The suspect has a Florida license but may have been staying in New Jersey. He was shot by police. He’s hospitalized and can’t be reached for comment while in custody. He is in surgery and is expected to survive. A U.S. official briefed on the investigation also confirms the man’s name. The official was familiar with the investigation but wasn’t authorized to speak publicly and spoke to The Associated Press on condition of anonymity. Police Commissioner James O’Neill was asked at a news conference whether the suspect shouted the phrase, which means “God is great” in Arabic, or something like it. O’Neill replied: “Yeah. He did make a statement when he exited the vehicle,” though he declined to elaborate. He says the 29-year-old man entered the bike path and drove south, hitting pedestrians and cyclists. He then hit a school bus, injuring at least two adults. He says the man exited the vehicle brandishing a paintball gun and a pellet gun. He was then shot in the abdomen by a police officer and is now hospitalized. President Donald Trump is declaring “NOT IN THE U.S.A.” after a man in a rented truck plowed into a busy bike path near the World Trade Center, killing at least eight people. The driver jumped out of the truck Tuesday with a fake gun in each hand and was shot by police. He’s hospitalized. New York City’s mayor says a truck attack in lower Manhattan killed eight people and was a “cowardly” act of terror. New York Gov. Andrew Cuomo called it a “lone wolf” attack. He says there’s no evidence to suggest it was part of a wider plot. Witnesses described a chaotic scene of a white pickup truck hitting bicyclists on a path near the World Trade Center and then slamming into a school bus. They say the driver got out of his vehicle brandishing what appeared to be a gun in each hand. The official was familiar with the investigation but wasn’t authorized to speak publicly and spoke on condition of anonymity. New York City police say there are “several fatalities and numerous people injured” after a motorist drove onto a busy bicycle path and struck several people, then emerged from the vehicle screaming and firing something that appeared to be a gun. The New York Police Department posted on its Twitter feed that one person was in custody. The department says it’s unclear whether anyone was shot. It’s unclear how many people have been injured or whether anyone was killed.